This version of aTube Catcher is not compatible with your operating system, veja a versão compatível. The last word to download and convert videos from the internet. This program is show! The ultimate alternative to downloading videos from the internet has come and pulverized the competition. ATube Catcher downloads recordings of dozens of pages and can even automatically convert them to different formats soon after download. Sometimes he can play the role of an editor, downloading several footage and putting them together into a single file. The program also serves as a converter for the multimedia content you already have. And that's not all, it also can burn CDs and DVDs, record everything that is happening on your PC screen and is translated into Portuguese. That is, an excellent tool for those who want to increase and organize their collection of videos. YouTube, Stage6, MySpace, Dailymotion, Megavideo, Google Video, Metacafe, iFilm, Yahoo! and Vimeo are just a few examples of all the sites with which aTube Catcher is compatible. To see the complete list click on this link . You download, save the file to your computer or to your portable phone, player or video game. While installing aTube Catcher, you need to pay a little more attention than you are accustomed to. This is because the program offers and installs by default additional software that has no relation to its operation. So, if you do not want your computer to be clogged with useless applications, be sure to uncheck the checkbox for that unnecessary add-on program, as shown in the image above. The main goal of aTube Catcher is to provide mechanisms for you to download videos from the internet. So when you open the application, the section for that purpose is the first thing you come across. Basically, all you have to do is paste the URL of the desired recording, choose the destination folder, select the required format (check the list of supported extensions at the end of the text) and press a button. The program makes your life even easier, because whenever you copy the link from any of the recognized pages automatically the address is already selected for download. Videos that are added to other pages (for example, blogs) can also be downloaded as long as the original code is not modified. In this same screen, it is possible to activate the Turbo Download mode, technology that promises to accelerate the transfer rates by up to 600%, that is, the downloads will be carried out at very high speed. In addition, you can enable the feature that downloads YouTube videos to the highest quality available and set the downloaded source files to be retained after conversion. Some video hosting sites have restrictions on the size of uploads. Therefore, it is common to see longer recordings divided into several parts. ATube Catcher, in addition to downloading, is also capable of concatenating multiple videos in a single file. So you do not even have to use an editing program just to paste the various downloaded footage. Just go to the Tools menu and click Download and add videos to get started. In the small open window, paste the addresses of the videos you want to put together. It is not necessary to use links from the same website, and this gives room for your creativity. Select the videos and mix as you see fit. You just need to keep in mind that the more videos you list, the longer the conversion can take. ATube Catcher uses your login and password from sites like Dailymotion, YouTube, CrunchyRoll, Orange and Kewego to authenticate your accesses. That way, you can download personal files or those that require registration verification. In addition, this engine also provides support for playlists. Just enter the address of a playlist and you are asked which videos you want to download, so you can choose all of them. The rest is a count of aTube Catcher, which manages downloads and conversions one by one. More than just converting the newly downloaded files, this application allows you to change the format of any of the recordings of your collection. The process is quite simple: you just need to drag the desired footage onto the program screen with the Video Converter tab open, indicate the required extension and click a button. After that, wait for aTube Catcher to finish its work. Real-time streaming of multimedia content is becoming more and more common. If you come across a video of this nature and want to watch it later, aTube Catcher enables you to store it through the StreamCatcher function. Just be on the page that contains this media and wait for the software to capture the broadcast signal. Another very interesting feature of aTube Catcher is the ability to record audio and video simultaneously or separately from your computer's desktop. Whatever happens on the desktop, this program logs and saves the files in a pre-determined directory. This tool can be very useful, for example, for those who want to create tutorials to help friends or family with some difficulty in the PC or those who for some reason wish to save a conversation in instant messengers. The features offered by aTube Catcher do not end there. It even provides a tool with which you can select any footage saved on your computer and burn it to an optical disc such as CDs, DVDs and even Blu-ray media if your drive is compatible. It is worth remembering that the discs recorded with this program can be reproduced in the domestic appliances without any problem. ATube Catcher is compatible with most audio and video formats used today. Among the supported extensions are MPEG4, AVI, 3GP, 3G2, XVID, MP4, MP3, MP2, WMA, WMV, GIF, FLAC, WAV, PSP, MPG, VOB, OGG, MOV and more. It's no wonder aTube Catcher is one of the most downloaded Baixaki apps. The program has a wide variety of tools, allowing you to find and download videos on the internet in several ways without needing to warm your head and in a qualified way - one of the greatest strengths of it. Its interface is not the most beautiful or organized, since the tabs that segment its features are full of links, check boxes, buttons and fill fields. With this, at first, you may have the impression of being lost. But do not worry, because the intuitive icons and the almost complete translation of the program into Portuguese (except for a few buttons and links) make your interaction quite uncomplicated. Even if you have never touched a software of this kind, you should not find it difficult to assimilate your resources. Another highlight of aTube Catcher is its low consumption of computer resources. During our analysis, we recorded the increase of only 15 MB of RAM and between 9% and 10% of the CPU during the peak of this component's maximum demand. Both the download and conversion performance of this app proved to be satisfactory. In the tests we did, the program was able to download a file of 212.25 MB in about two and a half minutes. According to the configuration we made, in sequence, he performed the automatic conversion in another three minutes. So, in just over five minutes, the HD video was ready to be enjoyed. Whether you choose the before or after download conversion, your own FLV player, the multi-page login and password tool, and the multimedia features are just a few examples of the aTube Catcher features. The video joiner is the latest example of how this application has not stopped in time and goes after new tools so you have more features and practicality when downloading your favorite videos from the internet. 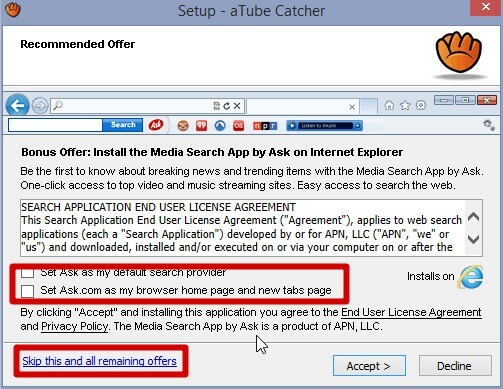 If you have not found good software to download and convert YouTube footage or are not satisfied with yours, take the opportunity to download aTube Catcher. You will be impressed.